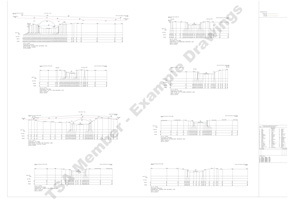 This is an extract from a river survey showing cross sections taken at regular intervals along the river With some sections depicting a ‘restriction’ such as a bridge river crossing. This was part of a multi sheet survey. Normal production of sections may require an exaggeration between the Horizontal and Vertical scales but this would be requested by the client. These examples have been produced at a natural scale of 1:100m commensurate to the horizontal ‘ground’ plotting accuracies. 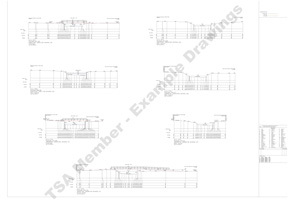 This is an extract from a river survey showing cross sections taken at regular intervals along the river With some sections depicting a ‘restriction’, such as a bridge river crossing. This was part of a multi sheet survey. Normal production of sections may require an exaggeration between the Horizontal and Vertical scales but this would be requested by the client. These examples have been produced at a natural scale of 1:100m commensurate to the horizontal ‘ground’ plotting accuracies. 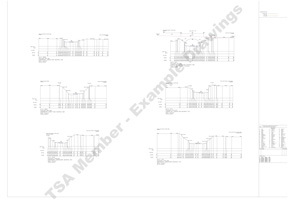 This is an extract from a river survey showing cross sections taken at regular intervals along the river. This was part of a multi sheet survey. Normal production of sections may require an exaggeration between the Horizontal and Vertical scales but this would be requested by the client. These examples have been produced at a natural scale of 1:100m commensurate to the horizontal ‘ground’ plotting accuracies. 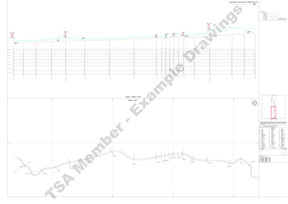 This is an extract from a river survey showing the plan and position of cross sections together with the ‘Long Section’ extracted from the ‘Lowest bed levels’ along the river bed. This was part of a multi sheet survey. 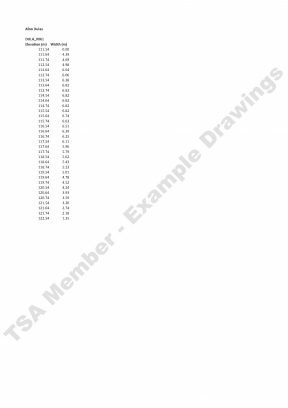 Normal production of sections may require an exaggeration between the Horizontal and Vertical scales but this would be requested by the client. These examples have been produced at a natural scale of 1:100m commensurate to the horizontal ‘ground’ plotting accuracies. This is photographic evidence of each cross section of a river survey showing the chainage, description of the photograph, the start co-ordinates and the bearing of the photograph. 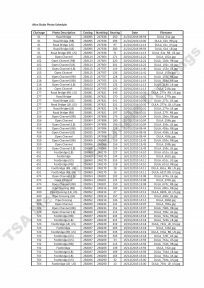 The data and photograph file name is also listed. This is a height and width table which defines the aperture of a bridge. For every 100mm increment in height the width of the bridge is specified. This is calculated from the bed level of the bridge to the soffit.